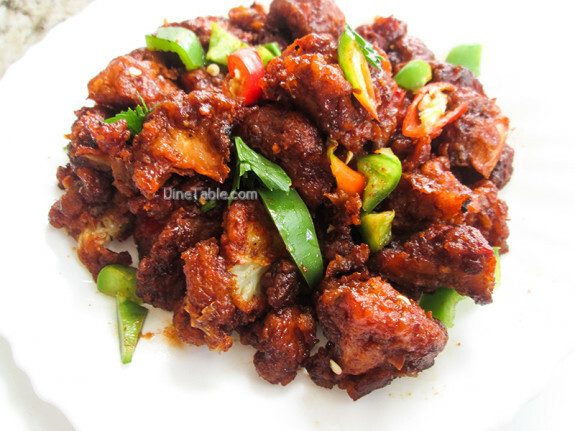 Dragon Gobi Recipe / Restaurant Style Cauliflower Recipe is a tasty and delicious Chinese vegetarian side dish recipe. 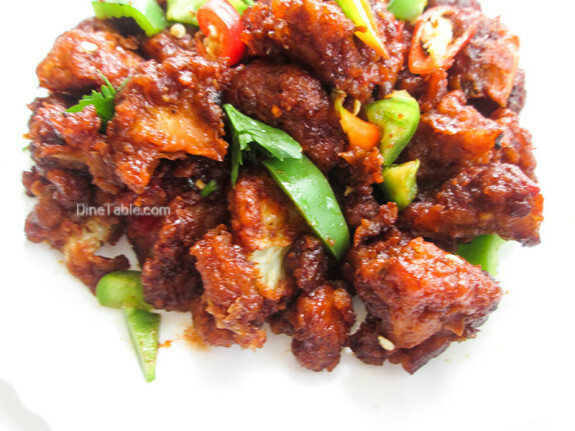 This spicy Chinese recipe is a must try for those who are strict vegetarians but are admirers of Chinese food. It is a nice accompaniment with Chinese fried rice. Cauliflower is very low in calories. It is an excellent source of vitamin C, vitamin K, folate, pantothenic acid, and vitamin B6. Further, It is also a good source of minerals such as manganese, copper, iron, calcium and potassium. 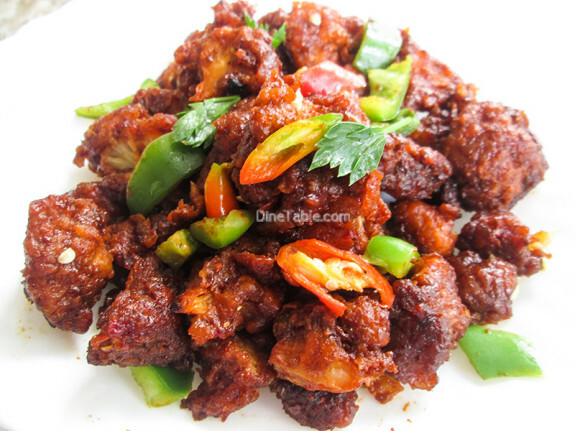 Click here for other tasty and delicious Indo-Chinese Recipes.. Boil water in a pan and add a little salt and 1/4 tsp turmeric powder. Add cauliflower florets into this and cook for about 5 minutes. Drain the water and keep it aside. Take a bowl and add maida, cornflour, ginger-garlic paste, soya sauce, salt and make a thick batter by adding enough water. Heat vegetable oil in a pan and fry the marinated cauliflower and keep it aside. 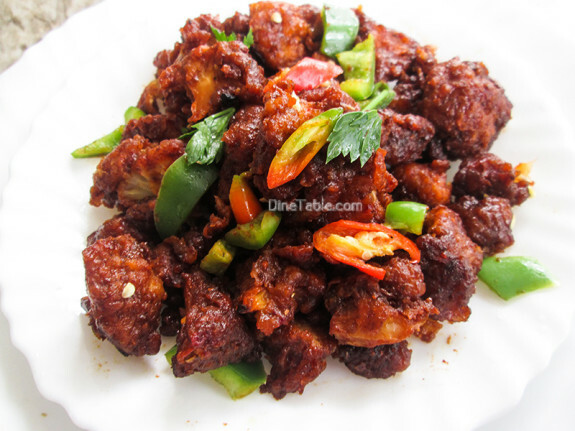 Heat 4 tsp of vegetable oil in a pan and add cashew nuts, dry red chilies and sauté for 3 minutes. Remove and keep it aside. In the same pan, add chopped onion, capsicum, green chilly, ginger, garlic, celery and salt. Stir well till the onion turns transparent. Add dark soya sauce, tomato sauce, red chilly paste, pepper powder, sugar and stir well for 2 minutes. 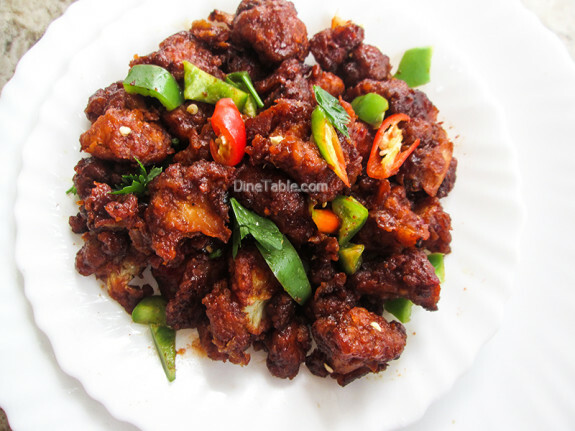 Add the fried cashew nuts, dry red chilies and fried cauliflower and mix well. Cover and cook in low flame for 5 minutes. Switch off the flame. 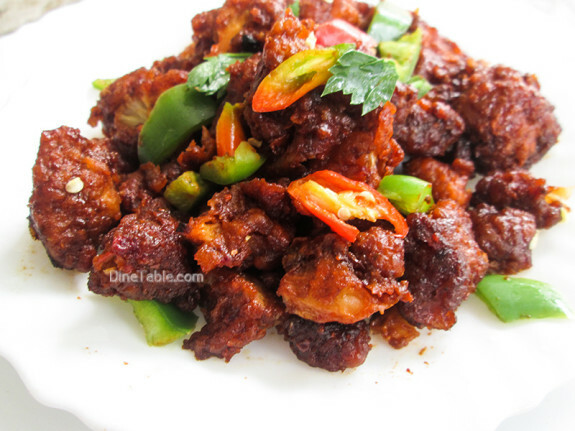 Tasty Dragon Gobi is ready.